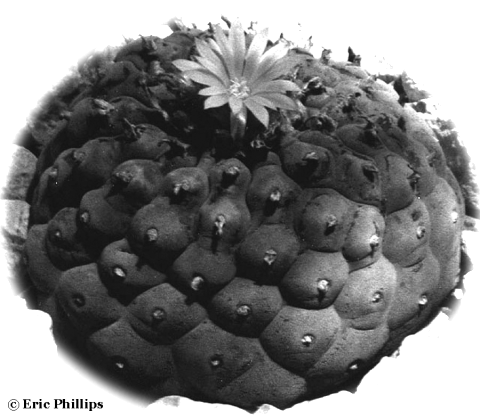 This is another name that is encountered in the horticultural literature and is sometimes offered as plants and/or seeds. It has also been used to describe plants encountered in the wild exhibiting a particular growth form. This was originally employed, by Leon Croizat, to describe plants which have well defined tubercles but often lack sharply defined ribs. Sometimes these have squarish or trapezoidal tubercles defined by deep furrows. Unfortunately, that concept sprawls across several of the recognized species. 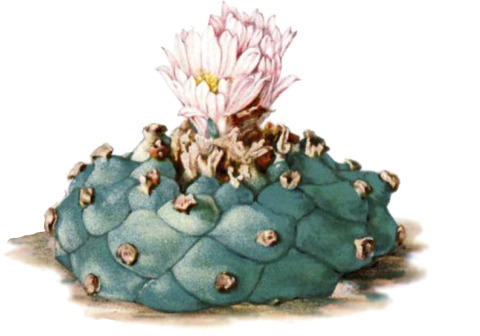 This name contains a very nice example of the problems that have resulted when workers have not recognized the variability of Lophophora and attempted to assign a name to a plant expressing a variant mophology. Croizat 1944: “Lophophora williamsii (Lem. ex Salm-Dyck) Coult. decipiens var. nov.
Culta pusilla ca. 5-6 cm. lata. Costis primum ca. 1·1, subtus in tuberculis conicis solutis. Flore roseo, in anthesi tubo elongato primo intuitu peculiari. 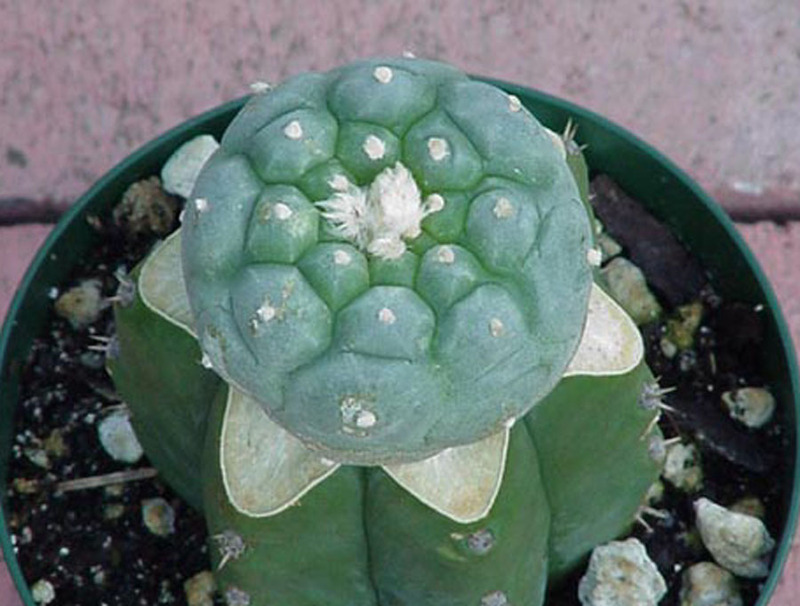 Due to the ash grey body color, an appearance more tubercled than ribs and a flower said to be pink or rose Koehres and others have assigned this as a form or variety of Lophophora fricii. I’d suggest that thought to be on solid ground but only partially as we are about to see. 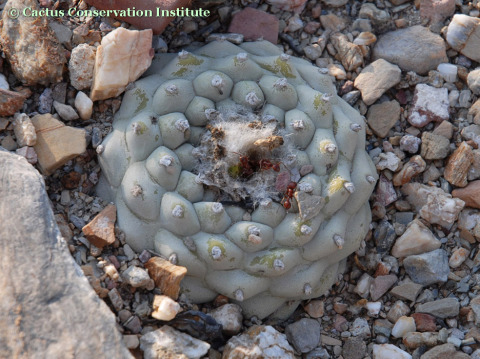 Lophophora diffusa In habitat; photo from CactusConservation.com. One recent seed offering noted that their seeds were collected near Vizarrón, Queretaro so that one at first glance seemed easy to untangle. However, both of their offerings producing seeds with this name were described as being grey in color. Variations in how people define color terms may be involved; this may be perceptual but there are also cultural differences in color term definitions. It is conceivablethat the body color of the diffusa shown above could be called grey by one person and yellowish-green by another. Anderson rejects the name “decipiens” entirely stating that it only refers to plants which were said to be basally tubercled or to have pronounced tubercles but indistinct ribs, and flowers which projected farther above the top of the plant. I agree with Anderson and believe this name should only be used with clear qualifiers included. 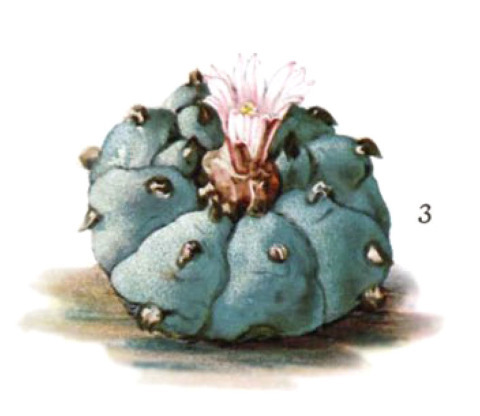 The name Lophophora decipiens was apparently described by Croizat based on a figure appearing as part of a plate in Britton & Rose 1922, Vol. 3, Plate 10, fig. 4. This picture is a drawing made from a photograph taken of a plant which was obtained via France. The collection locality and origin was unknown. See Anderson 1980 page 184 or Britton & Rose 1922 [or the 1977 reprint]. Incredibly, this drawing was designated as the type specimen by Croizat on the basis of him having another peyote plant that resembled it. 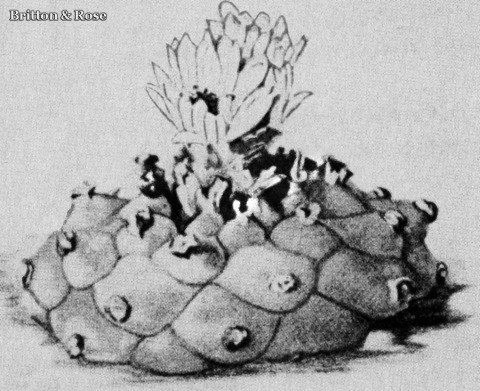 Croizat described decipiens as having up to 11 ribs and only growing to 6 cm in diameter which seems peculiar as the material he examined first-hand was apparently limited to that one plant and the type specimen was not accessible to him. Backeberg 1961 lists a short entry on page 2899 and assigns this name to Fric’s picture #III (i.e. what became Lophophora fricii) in figure 2731 on page 2903. Backeberg clearly had some major frustration with this genus. 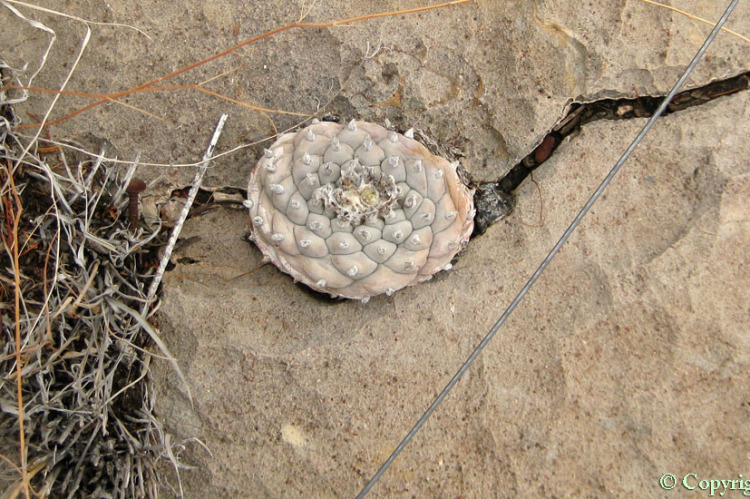 Pizzetti 1985 describes decipiens as being a small form with conical tubercles. Apparently a newer definition exists; diverging from all of the above as Lophophora fricii var. decipiens. Expect more confusion surrounding this name in the future as it now appears to be applied to wild material collected near Bahan, Coahuila. 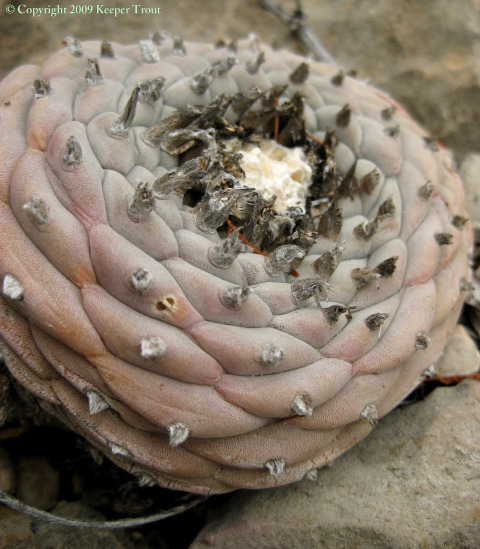 Sergei Batov describes these plants as having light pink to even lighter pink flowers up to 1.5 cm, grey-green skin, rhomboid tubercles and 8-10 spiral ribs [1999 e-mail forwarded by M.S. Smith]. The modern attempts to describe the Coahuilan material by this name obviously lack any linkage to Croizat’s type but if “decipiens” is being assigned as a varietal name, it would seem to be fair game. It would also be just as fair and accurate to use decipiens as a descriptive horticultural term to apply to the form when it is being expressed by any of the other known species (for examples: Lophophora diffusa “decipiens” and Lophophora williamsii “decipiens“). Plants showing this growth form occur not as populations but as individuals within larger populations of what is sometimes referred to, in the West, as L. williamsii var. echinata (Croizat) Bravo sensu Weniger. This also overlapped with what was viewed as Anhalonium Lewinii during its early years. See additional comments here under those names. In the images mentioned as being shown in Bohata et al. 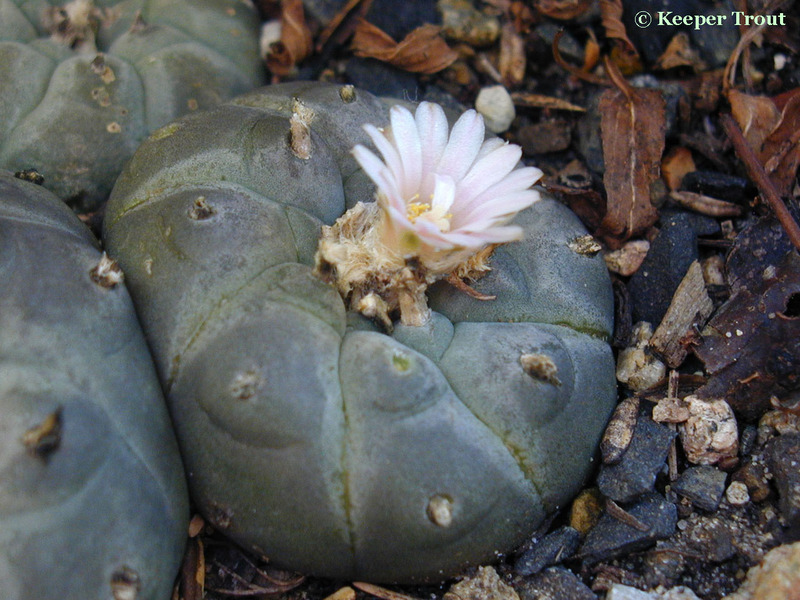 2005 it is quite clear that this growth form can occur in both L. fricii or L. williamsii and that both can be found *within Coahuila*. See also Anderson and/or Benson and/or Bravo. To be sure we are clear about the origin of our subject matter let’s look at Britton & Rose’s “decipiens” compared to their illustration of a typical L. williamsii. Britton & Rose (1922) Vol. 3, Plate X, Figure 3. 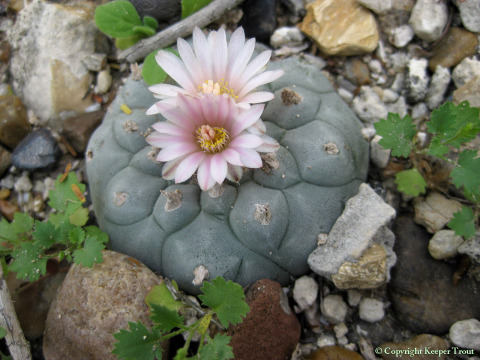 Lophophora williamsii. Britton & Rose (1922) Vol. 3, Plate X, Figure 4. A nice picture approximating this form (but with severely spiraled ribs) is presented (accordingly) as L. diffusa in Lamb & Lamb 1978: Vol. 5; page 1297. 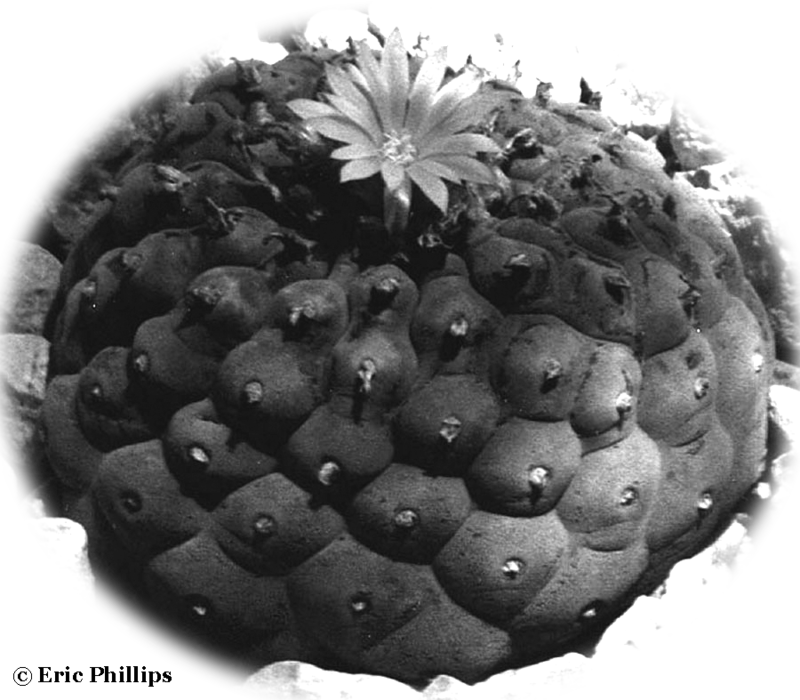 Backeberg 1977 shows pictures for Lophophora williamsii var. 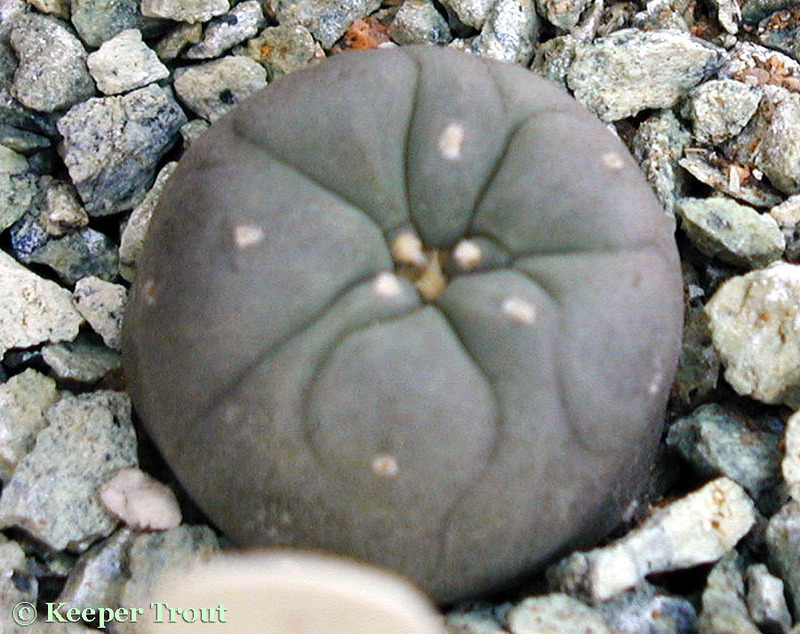 decipiens which appear to be Lophophora williamsii. As was mentioned earlier, he also assigned this name to a photo of Fric’s sp. fl. 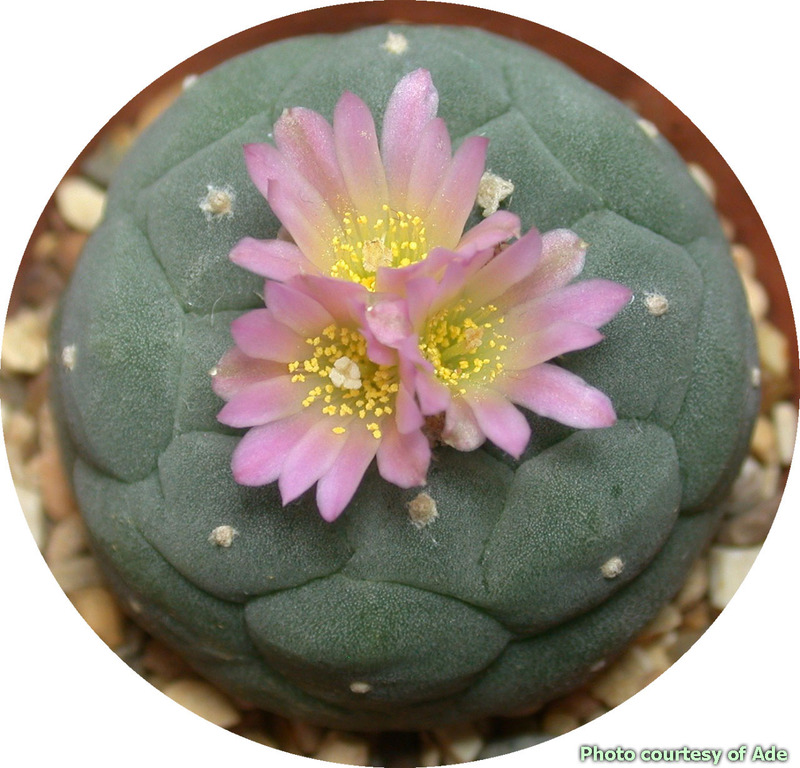 rosea, the plant that went on to become Lophophora fricii. 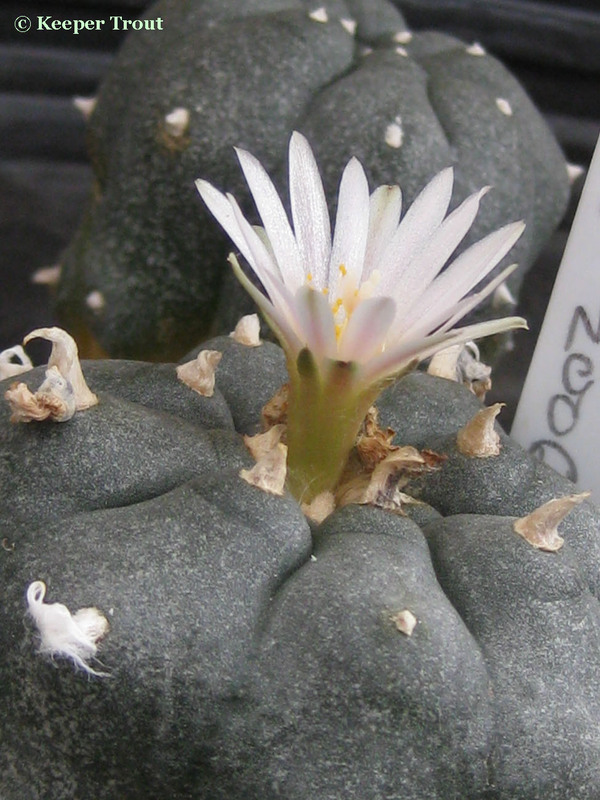 Plants or plants grown from seeds originating in Europe (during the early 1980s) appeared to all be L. williamsii and what I have seen did not show the tubercle form mentioned and were called L. williamsii var. decipiensfor possessing larger and longer flowers than the species. In one case their flowers were described by their vendor to be violet-rose colored. (“grösse, längere, violetterosa Blüten”). The plants which grew from their seeds were clearly L. williamsii and were blue-green in color. Rabbits prevented my seeing their flower. Mescaline 0.724% (± 0.092) [dry wt?]. See also Habermann 1975 for a discussion of this ‘species.